The Perfect Protective Style for the Perfect Naturalista! Our brand new Playful Pinneaple Pony Drawstring collection mimics the gorgeous and fashionable high curly ponytail. 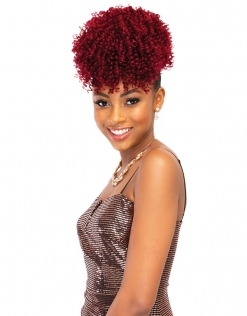 This curly textured ponytail line is constructed as the classic drawstring but better, it features bangs! This hair is made with the finest heat resistant synthetic fibers. Feel free to heat style up to 360 degrees.